This topic contains 13 replies, has 3 voices, and was last updated by Sekander Badsha 4 years, 2 months ago. I have a question about direct bank transfer in the multi-seller platform Dokan. Buyers pay me (the site) when they buy a product. When using a method different then direct bank transfer, the payment is immediate and the following doesn't matter. But when a buyer wants to pay using direct bank transfer, how does this work in combination with sellers. I tested it last night and noticed that when a order is made by a customer, the order is set to ‘payment pending', like it should, but then it is immediately set to ‘on hold'. It looks like this means that a customer has payed because that's when the amount is added in the reports. A seller sees a order has come in and can immediately act to prepare and set it, but he doesn't know for sure in this case if the customer has payed yet. Am I seeing this correctly, how can have more control over this situation? Because in my opinion you want to notify a seller of a order only after a buyer has payed for the order. Could you please clarify this for me. I had a discussion with the dev team. The payment and the payment status is controlled by WooCommerce. So we can not do anything with it. If you want to change anything, you have to overwrite WooCommerce files, which is not recommended. Oke thanks, I will contact them to further locate the problem. The fact that the amount is added and that the seller can edit the order is controlled by Dokan. The problem is not that the status is changed but the way Dokan deals with it. Woocommerce sets orders on-hold because payment processing is outside the bounds of the website and is a manual process. So the current way Dokan deals with this order status is wrong. When a product is set to on-hold, the order should not be updated to a seller. The seller should not be able to see this order, because that would mean a seller could send a product before the customer has payed. It should also not yet be updated in the dokan reports (like with payment pending), because there has not been payed yet. Please let me know when this will be fixed. Please read my previous reply. The system is controlled by WooCommerce. Dokan is just taking the inputs from frontend. So we can not do any thing regarding this. Please read my previous reply. I am talking about the way Dokan handles the on hold status. I am talking about the way the commission is handled. I am talking about the orders that are visible to sellers. Please correct me if I am wrong, but this is all part of Dokan. This is a pretty big problem within the Dokan plugin, please help me solve this. Or tell me when a fix will be implemented. WooCommerce does not work like the way you are asking. We have kept everything they way they are in the default WooCommerce system. Inside that function, you can filter mails via that function. This will prevent sending mails to the seller, when the order status is “on-hold”. You can't keep everything as in default WooCommerce, otherwise your plugin wouldn't work. There is a essential difference between Dokan and WooCommerce: Dokan is multivendor. Sellers sell products through my website. 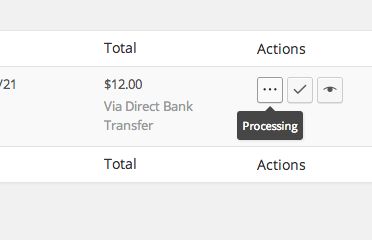 Because WooCommerce handles payment, I know when a customer payed with direct bank transfer, my sellers do not. So I need a way to control this. This is necessary to make the Dokan multi-vendor concept work. Otherwise Sellers can send there product before the customer has even payed. It is pretty essential for a good working multi-vendor environment. A possible solution is to add order-status Payed. When a order has come in, a e-mail is sent to the seller and the order becomes visible in the seller dashboard. In this way there is more control on payments. What if a customer hasn't payed yet and the seller has send his product? Although the above proposed solution makes sure no e-mail is sent when the order status is on-hold, it also means that no e-mail is sent at all. And the order is still visible for the seller, even though the seller didn't get an e-mail, the seller can still act on the order. Should I maybe use a different payment gateway then standard WooCommerce Direct Bank Transfer? From my view best solution is – alert your seller at first point. When a Seller going to register on your website make sure that seller knows correctly what is the scenario regarding BANK TRANSFER PROCESS. – When Customer submit an order and choose payment method “BANK TRANSFER”, Seller also get notification email and can see what is the Payment Method is: BANK TRANSFER . – Now, Seller can see the ORDER Status ON HOLD from Dashboard. – Now once you marked that order as processing – your seller can see that as well from their dashboard. – Now, seller can prepare the product – ship and mark as completed and everything goes smoothly. Please NOTE:: Any time admin(you) or seller can change the order status. If you (admin) or seller change order status failed/refund/cancelled then all information (data) reversed. So, all commission reversed automatically. So, this is the only scenario i can see which will work. If you have any other idea feel free to share with us. We really don't want to interrupt with WooCommerce default system because then it will be very hard to maintain. We spoke with Woo Team regarding multi-vendor future with WooCommerce and seems like they are also considering to make WooCommerce more multi-vendor friendly. Of course you recommend this approach, this is the only possible way at the moment. – Even though the order is on hold, the seller can already act on it. Of course I can write a procedure, but that doesn't mean people will act on it. I understand that Dokan builds on WooCommerce, but all I am talking about is Dokan functionality: Dokan dashboard, seller dashboard and seller roles are added by Dokan. This is Dokan functionality. I understand that the way direct bank transfer is implemented is WC functionality, but the fact that commission is taken of earnings; earnings are shown in dokan dashboard; orders are shown in seller dashboard; mails are sent to sellers: you are in control of that. – When a order is on-hold: don't sent mail to seller, don't show it in seller dashboard, don't take commission and add amount to Dokan dashboard. – After Admin has changed on-hold to processing: sent mail to seller, show in seller dashboard, take commission and update dokan dashboard. If you need to modify the features right now, you may hire a developer. The topic ‘Direct bank transfer’ is closed to new replies.